Not to be confused with Big Bear Lake, California. 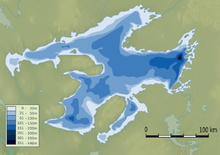 The Great Bear Lake (Slave: Sahtú; French: Grand lac de l'Ours) is the largest lake entirely in Canada (Lake Superior and Lake Huron straddling the Canada–US border are larger), the fourth-largest in North America, and the eighth-largest in the world. The lake is in the Northwest Territories, on the Arctic Circle between 65 and 67 degrees of northern latitude and between 118 and 123 degrees western longitude, 156 m (512 ft) above sea level. The name originated from the Chipewyan language word satudene, meaning "grizzly bear water people." The Sahtu Dene people are named after the lake. Grizzly Bear Mountain on the shore of the lake also comes from Chipewyan, meaning, "bear large hill." The Sahoyue (Grizzly Bear Mountain) peninsula on the south side of the lake and the Edacho (Scented Grass Hills) peninsula on the west side form the Saoyú-ʔehdacho National Historic Site of Canada. Bathymetric map of Great Bear Lake. The lake has a surface area of 31,153 km2 (12,028 sq mi) and a volume of 2,236 km3 (536 cu mi). Its maximum depth is 446 m (1,463 ft) and average depth 71.7 m (235 ft). The shoreline is 2,719 km (1,690 mi) and the catchment area of the lake is 114,717 km2 (44,292 sq mi). Great Bear Lake is covered with ice from late November to July. The lake is known for its considerable clearness. Explorer John Franklin wrote in 1828 that a white rag placed in the water did not disappear until it exceeded a depth of 15 fathoms (27 m). Arms of Great Bear Lake include the Smith Arm (northwest), the Dease Arm (northeast), the McTavish Arm (southeast), the McVicar Arm (south) and the Keith Arm (southwest). The community of Deline is located on the Keith Arm near the outflow of the Great Bear River that flows west into the Mackenzie River at Tulita. Rivers flowing into Great Bear Lake include the Whitefish River, Big Spruce River, Haldane River, Bloody River, Sloan River, Dease River and the Johnny Hoe River. Great Bear Lake lies between two major physiographic regions: the Kazan Uplands portion of the Canadian Shield and the Interior Plains. It was part of Glacial Lake McConnell in the pre-glacial valleys reshaped by erosional ice during the Pleistocene. Since, the lake has changed from post-glacial rebound following the ice melting. Precambrian rocks of the Canadian Shield form the eastern margin of the McTavish Arm. These rocks of the Precambrian are sedimentary and metamorphic deposits supplemented by igneous intrusions forming dikes and sills. The Deline settlement is on the lake, near the headwaters of the Bear River. There is an ice crossing from Deline to the winter road on the far side of the Great Bear River. On 5 March 2016, a tank truck fell partway through the ice road just a few days after the government had increased the allowed maximum weight limit to 40,000 kg (88,000 lb) on the road. The truck, which was 3 km (1.9 mi) outside of Deline and close to the community's fresh water intake, as well as a major fishing area, contained approximately 30,000 l (6,600 imp gal; 7,900 US gal) of heating fuel and was one of 70 truck loads intended to resupply the community. The fuel was removed from the truck by 2 am, 8 March. Three lodges around the lake are destinations for fishing and hunting. In 1995, a 32.8 kg (72.3 lb) lake trout was caught, the largest ever caught anywhere by angling. In 1930, Gilbert LaBine discovered uranium deposits in the Great Bear Lake region. The former mining area Port Radium, site of the Eldorado Mine, where pitchblende was discovered, was located on the eastern shore. Echo Bay Mines Limited leased the old camp and mill at Port Radium to recover silver and copper values from 1965 to 1981. The Great Bear Lake is paramount in the Délı̨nę people’s identity, laws and culture. Hence, conserving it is critical for the Délı̨nę people. ɂehtsǝ́o Erǝ́ya, a former member of the Dene peoples, is widely regarded as a prophet, making over 30 prophecies which have widely come true . His prediction for the end of times claims that as the world dries up, the little remaining life will flock to and end on the banks of the Great Bear Lake, a lake seen as a physical beating heart to humanity . The Délı̨nę people have followed these prophecies closely; the cultural considerations being a diving force for self-governance and environmental sustainability . ^ "Natural Resources Canada-Canadian Geographical Names (Grizzly Bear Mountain)". Retrieved 2014-12-20. ^ "Saoyú-ʔehdacho National Historic Site of Canada". Retrieved 2014-12-20. ^ "Northwest Territories Protected Areas Strategy (Saoyú-ʔehdacho)". Retrieved 2014-12-20. ^ "Great Bear Lake". World Lakes Database. International Lake Environment Committee. Archived from the original on 5 June 2011. Retrieved 2 February 2013. ^ Franklin, John (1828). Narrative of a Second Expedition to the Shores of the Polar Sea. Carey, Lea, and Carey. p. 264. ^ "The Atlas of Canada - Toporama". Natural Resources Canada. Retrieved 23 January 2015. ^ "Whitefish River". Geographical Names Data Base. Natural Resources Canada. ^ "Big Spruce River". Geographical Names Data Base. Natural Resources Canada. ^ "Haldane River". Geographical Names Data Base. Natural Resources Canada. ^ "Bloody River". Geographical Names Data Base. Natural Resources Canada. ^ "Sloan River". Geographical Names Data Base. Natural Resources Canada. ^ "Dease River". Geographical Names Data Base. Natural Resources Canada. ^ "Johnny Hoe River". Geographical Names Data Base. Natural Resources Canada. ^ Lionel Johnson. "Great Bear Lake" (PDF). Canada Department of Fisheries and Oceans Freshwater Institute. Retrieved 2015-02-12. ^ "Deline A" (CSV (3069 KB)). Canadian Climate Normals 1981–2010. Environment Canada. Climate ID: 22010KA. Retrieved 2014-01-09. ^ "Deline - "Where the Water Flows"". Spectacular Northwest Territories. Northwest Territories. Archived from the original on 26 July 2014. Retrieved 19 August 2014. ^ "Impassable ice roads delay holiday travel". CBC News: North. CBC. 23 December 2009. Retrieved 2 February 2013. ^ "Open and Close Dates for the NWT's Community Access Roads". Transportation. Government of the Northwest Territories. Retrieved 2 February 2013. ^ Windeyer, Chris (5 March 2016). "Fuel tanker plunges through Deline, N.W.T., ice road". CBC News. ^ Quenneville, Guy (7 March 2016). "N.W.T. hopes to remove fuel from tanker stuck in ice near Deline quickly". CBC News. ^ Quenneville, Guy (8 March 2016). "Fuel load successfully drained from tanker stuck in ice near Deline, N.W.T." CBC News. ^ "International Game Fish Association". ^ Schiller, E A. Geological Survey of Canada, Paper 65-11. Natural Resources Canada. pp. 42–. GGKEY:CR5H58XXBJZ. Wikimedia Commons has media related to Great Bear Lake. This page was last edited on 27 March 2019, at 20:48 (UTC).